8 bedrooms, all with seaviews and ensuite facilities. Sleeps up to 22 people. Experience one of Phuket's finest luxury villas, with private beach, infinity pool, stunning panoramic sea views and some of the World’s most spectacular sunrises and sunsets. Sleeps up to 22 in 8 bedrooms all with views and en-suite facilities. There is no better way to start the day than a homemade breakfast sitting by the pool. Ours is fresh, delicious and healthy. Including; fresh fruits, yoghurt, muesli, cereals, freshly baked croissant/pastries, breads, toast, butter & premium jams, fruit juice, and a selection of teas and coffee. We only use experienced and talented professional chefs, who prepare delicious food (both Asian and International cuisine) to the highest standards. Our chefs are just as happy working in a 5-star restaurant kitchen or giving you a 5-star lunch and dinner experience at the villa. The service includes the cost of the head chef, their helpers, shopping team, and serving staff. You only pay for the dishes you choose. Choose from a range of delicious options such as a poolside BBQ, classic Thai banquet, or homemade Italian favourites. Your driver will meet you at the airport in a modern minibus, and bring you to the villa. We offer you one free minibus transfer for every 10 guests at both the start and end of your holiday. If you require additional transfers these can be provided for US$106 each way. It's great to start your holiday without having to worry about the little things. Our welcome pack, pre-loaded into the fridge includes red and white wine, crisps, snacks, fresh fruit, bread, butter, jam, ham, eggs, milk, cereal, tea, coffee, sugar, soft drinks, fruit juice, even some cold beers! In fact everything a tired traveller or their family needs when they arrive. As a special luxurious treat we include a one hour Thai aromatherapy massage for each of your adult guests by experienced Thai massage therapists in the comfort of the villa. It is recommended you drink at least 3 litres of fresh water a day, and even more in the tropics. At roughly US$1.98 a litre this will save you a person daily, which equates to US$36 a day (based upon your group of 6 guests). And, this does not take into account the inconvenience, expense and time of having to buy and transport 18 litres of water every day for your guests. We have an unlimited supply of chilled fresh drinking water for your enjoyment and convenience. We understand you may require items as soon as you arrive, and going shopping after a long journey may be inconvenient, especially if you arrive late at night, or travelling with children. We offer you a personal villa pre-stocking service, for items that can fit into one family car, to help organise your shopping before you arrive. You only pay for the items at cost. You can check in up to 7 hours early, or check out up to 7 hours late, provided we do not have other guests arriving or leaving on the same day. Just check a few days before your arrival to see if the villa is available, and if so it will be offered to you without any extra charge. Enjoy a possible saving of 1 or 2 days of villa rental and a huge convenience when booking flights or travelling with children. Even arriving an extra 1 or 2 hours after a long journey, or leaving the villa 2 hours later before a flight can be a real blessing. You will find having a little extra help will greatly increase the enjoyment of your holiday at the villa. Our staff will keep the villa spotless, tidy your bedrooms daily and take away all the chores so you can relax, and focus on enjoying your holiday. Benefit from a 300mb ultra high-speed fibre-optic line with wireless internet throughout all bedrooms and living areas using the latest Google WiFi technology. Unlimited use of the Sri Panwa resort facilities inc: Gym, Spa, Tennis courts, 7 World class restaurants, beach club, private beach and in-resort transportation. We realise how important it is to feel welcome when you arrive. When you arrive, you’ll be greeted by smiles, cool drinks and refreshing chilled towels. Once refreshed, you’ll then be taken on a tour of the property, and introduced to the many facilities and features at Villa Baan Chirawan. You’ll quickly feel at home and you can relax and get on with the main job of enjoying your holiday. Our staff will always be available should you have forgotten anything or need advice. A friend on the ground, to recommend ‘must-do’ activities, the best local sight-seeing places and favourite restaurants. And, to help you book anything you need such as golf courses, special events, day trips, transport, sporting activities, yacht hire, spa treatments and excursions. You’ll find having your personal villa manager and concierge incredibly helpful, and will greatly increase the enjoyment of your holiday. Enjoy live TV from around the World, plus over 2,000 movies, all the latest TV Shows/box sets with new releases updated every month. With 40", 55" or 65" TVs in all bedrooms and living areas, plus a home theatre you'll always be able to catch something interesting to watch, the latest live sports or enjoy that movie night. For your comfort we supply luxury toiletries in the bathrooms. From our lavender scented body wash, to our rich conditioners your body will feel lovely and pampered. We supply a lovely selection of fresh tropical fruits each day for your enjoyment, and to help keep your body’s natural vitamins topped up. Our florist will prepare some beautiful bouquets of flowers for your enjoyment upon arrival. Not only will they showcase some of Thailand’s beautiful flowers, but will also add a splash of colour and scent to the villa. All 8 bedrooms are large and luxurious, fully equipped with air conditioning and handmade teak ceiling fans. They are equipped with large LCD HD TV’s with full international satellite channels, plus they all have personal mini bar facilities and spacious marble finished bathrooms furnished with huge walk-in showers with both rain and rail shower heads. Four bedrooms enjoy double ended baths, and one enjoys a two-person Jacuzzi and aqua-massager. Three of the bedrooms also have a second private open-air bathroom, as well as the interior bathroom. We only rent villas we personally own, and personally manage. This makes us very different from the vast majority of rental agents who often have 100's of properties to market, and often never even see the villas they rent. For you this means we are fully responsible for managing every aspect of your luxury holiday from the initial contact, right through to making sure your villa is spotlessly clean, and ready when you arrive. Just as you would expect from a leading specialist providing luxury villa holidays. Our approach allows us to maintain very high standards. The responsibility for everything always rests with us, and never a third party. We have teams of gardeners maintaining the lovely gardens, repairmen are on-hand should ever the need arise, and we use our own trust-worthy housekeeping staff, who have been with us for many years. We think of everything to give you a wonderful holiday experience. It is only possible to deliver and guarantee such high standards of luxury when you own and manage a small number of exclusive properties. It also means for you that you can be assured all property descriptions are 100% accurate, and you will not be left with a tired old property where the photographs are misleading or were shot 10 years ago. All our photographs are recent, and have been taken by ourselves. Reassuringly, we have been in business for 20 years, and own all the properties we rent. This demonstrates our stability, and financial strength in these times where agents seem to come and go overnight. It means you can relax having an experienced partner looking after you, and you can be assured your funds are totally safe, and your holiday villa will be exactly as we describe. ☆☆ TRAVEL WITH CONFIDENCE ☆☆ In business for over 20-years, we personally own and also directly manage each of our villas. Here's what makes us different, and why it's good news for you. Our reputation is second to none and it is important for you to know why we are so unique in luxury villa rentals. To ensure a wonderful, safe and trouble-free villa holiday see the following points that separate us from the crowd. Be aware of all rental companies that cannot guarantee you these same high standards. 1. We only rent villas that we personally own, and personally manage 2. Specifically designed by us for shared luxury renting - no-more tiny bedrooms, so all your guests are happy 3. All bedrooms are equally spacious and luxurious 4. All bedrooms enjoy en-suite bathrooms that are large, modern and luxurious 5. The small number of exclusive properties in our collection means the highest standard of luxury and personal service is not just promised – it’s guaranteed 6. Our photos are current and property descriptions are always 100% accurate 7. Our local staff are helpful, discreet, professional, and employed directly by ourselves 8. No agents, no agent fees and no double-bookings 9. Setting high standards for over 20 years 10. We are the preferred choice of discerning clients 11. Free personal Concierge Services to give you a friend on the ground 12. Your enjoyment and complete satisfaction is our number one priority Lastly, our goal is not to just rent you one of our villas – it is to ensure you have a wonderfully luxurious holiday in a stunning location, enjoyed in one of our beautiful properties. This can only happen when your villa meets and exceeds your expectations; when our service makes you feel at home, and when your holiday comes to an end, all you want to do is return. Until all these goals are met, we are not happy. Please read our reviews. I think they will reveal our commitment to ensuring that everything exceeds your expectations. All 8 indoor and outdoor bathrooms are designed in a clean and contemporary style. They are all very spacious and light with floor to ceiling opening doors and windows allowing the sun and cool winds to flow through. They are all marble lined, with solid marble sinks carved by hand. The stunning Sala room with panoramic sea views has a matching exterior bathroom. Just a minute away from the Sri Panwa private beach, just 2km away from the beautiful Ao Yon Beach. Both beaches are some of the only on the island that are safe to swim at all year round. 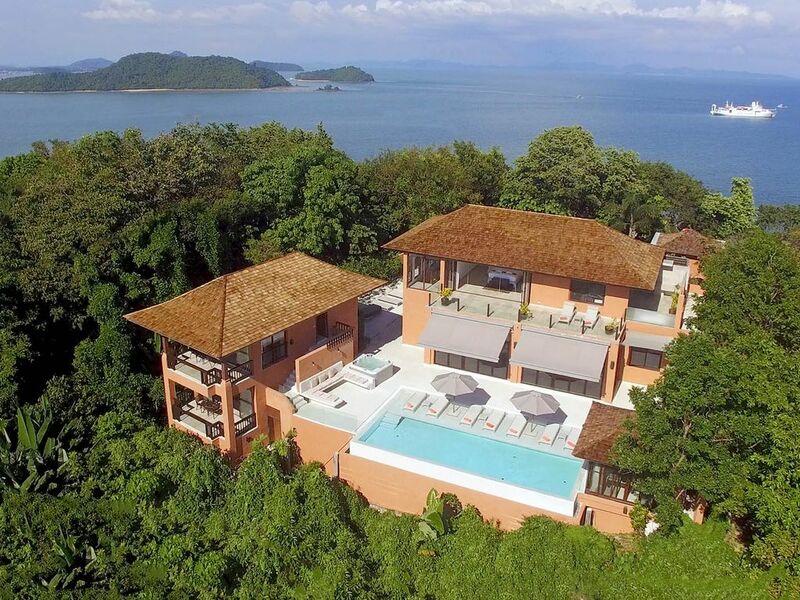 A luxury villa nestled atop the ultra-exclusive Sri Panwa resort, located on a private peninsular on the beautiful southern tip of Phuket. The winner of numerous awards for style and luxury. The villa boasts outstanding views over the sea to both the east and west giving you truly unforgettable sunrises and sunsets. As well as the villa’s beautiful private pool, there are also two further pools. Sri Panwa’s exclusive Beach Pool with hydrotherapy jets, and Baba Pool Club’s ocean view pool, are just a minute away. All bedrooms are large and luxurious with breath-taking views. 32", 42" or 65" HD TVs with 200+ satellite channels in 7 of the 8 bedrooms. 300Mb Extreme High-speed internet in each bedroom. Luxury memory-foam topped mattresses in all bedrooms. Finest Egyptian cotton bed linen. Quality toiletries and soft cotton luxury bath and hand towels in all en-suites. All en-suites are bright, modern, spacious, and feature marble and granite throughout as well as hand-carved marble sinks. Hairdryer. Air conditioning and silent, hand-casted fans with teak blades in all bedrooms. Personal mini bar facilities in each bedroom. Personal safe in each bedroom. Separate sitting areas/sofas in all bedrooms. We have just returned from a week of pure indulgence at Villa Baan Chirawan with 4 other couples. The villa is exceptional - spacious, beautifully appointed and everything is to the highest standard. The master bedroom was magnificent with stunning views and every convenience you could ask for, even a mini fridge amongst the ample cupboard space. With 4 couples as our guests, we were concerned that someone would end up with an inferior room, but each room was almost identical with superb views, so everyone was over the moon. The lounge and dining area is just gorgeous, open plan with a mixture of modern and thai furnishings. The snooker table proved to be an unexpected hit and the office area was really useful. And then there was the view!! No words can really describe how magnificent it is. Lying in the infinity pool, listening to the birds and gazing at the beautiful sunset was the highlight of every day. Total peace and quiet, we did not hear another soul whilst we were there. The staff were brilliant. They were all charming and efficient and the villa and outside were spotless. A huge plus was having the wonderful concierge, May, to help us. Her English was fluent and she quietly and efficiently organised everything for us. She communicated with the others on our behalf, organised taxis and trips out, booked restaurants and made herself available at all times. Nothing was too much trouble and we only wish we could have taken her home with us! We had asked for a private chef to cook lunch and dinner every day and it was the best decision we have made. Chef Khun Sao produced 12 - 14 different dishes for every meal, each one freshly made and better than any food we have eaten in a restaurant. She seemed to delight in our enthusiastic clapping every time we saw what was on the table and would then run back to the kitchen and whip up something else! The only problem was that when we ate a couple of meals out in some top restaurants, we all felt that Khun Sao's cooking was better! I just wanted to thank you for organising our fantastic stay in your villa. We all absolutely loved it, the villa was fabulous and the chef and food were out of this world. We had the most glorious five days, none of us wanted to leave !Thank you once again for a truly wonderful holiday. Thank you ! we aim to please at Chirawan and nothing is too much trouble, it is a truly memorable place to stay. We really hope to see you again soon. We just had to place a review on this villa, it was out of this world and lived up to the description without a doubt. From the discreet maid service to the beautiful infinity pool we could have stayed for months. We found it hard to drag ourselves away from the villa but once we did we had such fun, there is a lot to do, boat trips to the other islands, dining in fantastic restaurants, too much to try to do in the time we had. We hope to go back to see what we didn't manage this time !! We would recommend this to anyone wanting an exclusive, luxury holiday but with the chance to explore when the mood takes you. Just had to put my review on... fantastic place, villa superb, pool brilliant, beach sublime. I cannot praise enought the standard of this villa and I have stayed in some fantastic places. I could say it was the best and will certainly be difficult to top. The attention to detail in the decor and furnishings, scrupulously clean and was kept that way throughout our stay by the staff that were on hand. Lots to do and see, we were spoilt for choice. I would recommend this property for lots of things, family holiday or get together, groups of friends travelling with children and it would be fabulous for a romantic honeymoon !! Will definitely be on our list to visit again. Thank you so much for a superb stay. We visited Vila Baan Chirawan in December 09 and what an experience, we have never been anywhere so luxurious, it was like a dream. From the villa itself which is beyond description to our private beach, the pool and all the other amenities which are too many to mention here. I would recommend this to anyone and everyone. The holiday of a lifetime which will never be forgotten. Thank you for letting us book Baan Chirawan, total relaxation in superb, magical surroundings. We were completely taken care of at all times and would love to have stayed even longer. We would love to come back. Thank you. 7 World-class restaurants, including the award-winning Baba, frequented by celebrities such as Gordon Ramsey who has said: “the chefs in Sri Panwa are a class act and would be a huge success in London”. > Fully equipped gym with the latest equipment. > Tennis lessons, Thai boxing lessons, yoga & Pilate’s classes available. > 100m private pier boat dock. > Easy access to secluded white sand beaches and surrounding islands. Baba Soul Food serves up a delicious selection of home-cooked Thai food in a cosy, relaxed setting of intricate architectural detail and undisturbed, panoramic ocean views. Hot pot commonly Chinese fondue varieties of stew, consisting of a simmering metal pot of stock at the centre of the dining table. While the hot pot is kept simmering, ingredients are placed into the pot and are cooked at the table. Typical hot pot dishes include thinly sliced meat, leafy vegetables, mushrooms, wontons, egg dumplings, and seafood. The cooked food is usually eaten with a dipping sauce. Baba Chino, serves up loved Chinese dishes with the addition of Sri Panwa creativity & flair. The restaurant is open for lunch & dinner, serves traditional dishes with fresh ingredients & exquisite variety of Dim Sum, Crispy Pork, Abalone, Crispy Pigeon in Guangdong Style, BBQ Honey Pork & Guangdong style Roasted Duck & much more. The BBQ / Grill section has a variety of combinations to choose from. Enjoy an a la carte of mouth-watering selections which our chef carefully prepares for your taste buds. Choose your meat & seafood, sauces & sides. The marinade grilled premium meat & seafood is delectable as well as ingredients that are well-cooked by the 5-star Chef. All cooked in the Spanish Josper BBQ, an elegant combination of a grill and an oven. The World’s most stylish and exclusive rooftop bar is now open serving Sri Panwa’s delicious cocktails, alongside the sexiest sunset sessions. Baba Nest’s wraparound infinity pool surrounds the rooftop deck overlooking 360° panoramic views of the surrounding islands, the Andaman Sea and Phuket’s Southeastern peninsula. An exclusive selection of high-end cocktails, fine wines & champagne should get the evening started. Cool Spa services offer a five-sense experience within four extremely spacious treatment rooms, a private salon and a floating yoga deck – all of which enjoy panoramic ocean views. Our rates include:- Complimentary use of all of the amenities within the villa. A mid-week bedding change. Toiletries in the bathrooms. Indoor and outdoor towels. Complimentary transfer to and from the airport. Free (wireless) Internet Access Complimentary use of all amenities within Sri Panwa Resort, such as gym, tennis courts etc. Full time, 7-days-a-week ( 8 hours per day) of housekeeping services. Your FREE Personal concierge - a friend on the ground, to recommend lovely activities and help you book anything you need such as private chef's, our favourite restaurants, golf courses, special events, day trips, transport, sporting activities, yacht hire and excursions.